For even more information, visit the dedicated web site at www.NavNet.com! Today's NavNet has come a long way from the first multi-function display. Take one look and you will see just how far. A generous 9" or 14.1" display with edge-to-edge glass makes for a clean and stylish installation. The LED backlighting pushes light through every pixel on the screen for remarkable brightness. Anti-reflective glass coating is visible under any lighting condition. Configure the displays with a wide variety of sensors to build a navigation suite that meets your individual requirements. Be more hands-on with our easy-to-understand touch screen interface. TZtouch brings you pinch-to-zoom capability, as well as other multi touch gestures for the most intuitive navigation experience. You'll have full control of each component connected to the network right at your fingertips. Navigation is simplified by using your fingers to zoom and pan around the chart. As soon as your fingers touch the display, taps, pinches and swipes are instantly transformed into action. You will learn your controls so quickly that you'll be up and running in no time. To make operation even easier while underway, adjustments such as range and gain are easily made from either the on-screen touch menu or our patented RotoKey™. NavNet’s revolutionary RotoKey™ now merges the power and versatility of touch screen control with an easy-to-use rotary knob. One turn of the RotoKey™ gives you instant access to full control of NavNet TZtouch. Furuno elevates marine touch screen technology to an entirely new level with the industry's first multi touch MFD. The use of multi touch technology opens the door to a wide variety of gesture-based commands. NavNet TZtouch's waterproof display is also ruggedized to perform perfectly in wet, harsh conditions. NavNet TZtouch’s TimeZero™ technology delivers chart processing like you’ve never seen before – seamless chart handling, zooming and panning without the screen disappearing. TimeZero™ technology redefines the meaning of stress-free operation by smoothing out your chart handling actions. Equipped with powerful TimeZero™ technology, NavNet TZtouch will completely transform the way you navigate. You can scroll, pan, zoom in/out with a smooth, fast and seamless graphics engine. Navigating in a fully 3D environment offers you a true perspective and wider area of view around the ship, which allows you to better plan your routes, while TimeZero technology updates the information on your screen with virtually no redraw. 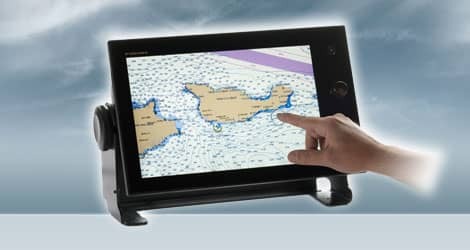 NavNet TZtouch is the only chart plotter on the market that provides users the ability to choose from official NOAA raster and vector charts, or optional “C-Map by Jeppesen” and “Datacore by Navionics” vector cartography, etc. Fully integrating a cutting-edge data algorithm with a high-resolution image processing technique, MapMedia delivers digital navigation charts and satellite photography with absolute clarity. MapMedia vector and raster charts are built upon 3D architecture, which is smoothly integrated with NavNet’s TimeZero™ technology. You can load any two ultra-wide high-resolution satellite photo areas at your convenience. Land areas (zero depth) are completely opaque, so these areas are displayed as high-resolution satellite photos on the chart. As the depth increases, the satellite photography becomes more transparent. This allows you to see where the shallows end and the deeper water begins, while still allowing the raster or vector chart to be visible. FURUNO has taken its NMEA award-winning radar technology to the next level with Ultra High Definition Digital Radar. UHD™ offers crystal clear target presentation with automatic, real-time digital signal processing. Antenna rotation speed (24/36/48 rpm) is automatically shifted to the appropriate pulse length. Commercial-grade radar performance is now available in the ultimate MFD navigation suite. NavNet TZtouch employs revolutionary real-time digital auto Gain/Sea controls to deliver a crystal clear radar presentation. With this new technology, NavNet TZtouch computes and applies an adaptive omni-directional anti-clutter filter with variable intensity depending on bearing. NavNet TZtouch’s simultaneous scanning technology allows dual progressive scan to display and update two radar pictures, both long and short range, at the same time as opposed to alternate update methods of typical conventional dual range radar. Autonomous control over gain and anti-clutter can be performed on each radar presentation. This can be used to have one screen with the gain set to locate birds and buoys, while you use the other radar screen to navigate. FURUNO Digital Filter (FDF™) Fish Finders feature advanced filtering capabilities and digital auto tuning, which eliminates noise, while delivering the ability to spot individual fish with clarity, accuracy and detail. Whether it is used for shallow or deep water, FURUNO FDF™ Fish Finders give you what you would expect from a Fish Finder at all times. FURUNO’s award winning network Fish Finders (DFF1/DFF3/BBDS1) offer a unique fish size analyzer function, ACCU-FISH™. The ACCU-FISH™ algorithm analyzes echo returns to compute individual fish size and display it on the screen. ACCU-FISH™ is capable of detecting individual fish at a depth of 2 m down to 100 m and computing the fish size of those ranging from 10 cm to 199 cm. NavNet TZtouch is built on an Ethernet network, allowing you to add as few or as many components as you desire, along with up to six displays, as well as CAN bus and NMEA2000 devices, to create your perfect navigation suite. The NavNet TZtouch system is built upon the most advanced chart plotter technology. Add to this a UHD™ Radar and an FDF™ Fish Finder, along with your choice from a wide variety of sensor options. It is easy to see how a NavNet TZtouch chart plotter display is the genesis to begin building the most sophisticated navigation suite available. Engineered to utilize the latest technology, NavNet TZtouch opens the door to cutting edge WiFi features, such as tablet and smartphone apps, points of interest (POI), real time weather data, software updates and more. Take full control of your NavNet in a whole new way. The TZtouch Remote app allows you to operate your system remotely with your smartphone or tablet over WiFi, when connected to the network. The weather tool is completely free and easy to use, giving you unlimited access to weather forecasts worldwide 24 hours a day provided by NavCenter. Select geographic coverage, data type, period of time, and then choose how to receive the file. NavNet TZtouch provides up to 16 days of weather forecasting. Anti-reflective glass coating is visible under any lighting condition.